He was born Morde-taluka, Sangmeshwar District, Ratnagiri, Maharashtra. 1904 Passed Carpentry Exam and Secondary Drawing Grade Examination, Ratnagiri School of Industry. 1905 Passed Drawing Examination, Baroda. 1906 Joined J.J. School, Bombay. 1909 Passed Drawing Teacher Examination. 1915 Art Teacher for two months during the leave vacancy period of artist M.V. Dhurandhar, J.J. School of Art, Bombay. 1917 Passed Art Masters Examination in Drawing and Painting, Bombay. 1917-20 Visiting Faculty, J.J. School of Art, Bombay. 1920-30 Art Teacher, The Fort and Proprietary High School, Bombay. 1913, 14, 15, 16 Exhb., Madras Art Society, Madras. 1916, 30, 31, 33, 35, 41 Exhb. in Mysore. 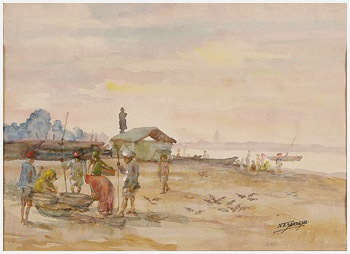 1927, 29 Exhb., Bombay Art Society, Bombay. 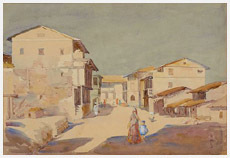 1930 Exhb., Simla Fine Arts Society, Simla. 2003 Manifestations, organised by Delhi Art Gallery, World Trade Center, Mumbai and Delhi Art Gallery, New Delhi. 2004 Manifestations II, organised by Delhi Art Gallery, Jehangir Art Gallery, Mumbai and Delhi Art Gallery, New Delhi. 2005 Manifestations III, organised by Delhi Art Gallery, Nehru Center, Mumbai and Lalit Kala Akademi, New Delhi. Sri Bhavani Museum, Aundh. Nagpur Museum, Nagpur. J.J. School of Art, Mumbai. Prince of Wales Museum, Mumbai. Delhi Art Gallery, New Delhi. 1913, 14, 15 Silver medal from Madras Art Society, Madras. 1914 Mayo Medal, J.J. School of Art, Bombay. 1916 Two bronze medals from Madras and Mysore. Six bronze medals at Patna, Mysore, Bombay and Madras. 1927 Chief of Ichalkaranyi Prize (for his painting `The Indian Beauty`). 1929 Gold Medal from Bombay Art Society (for has painting `High Expectations`), Bombay. 1930 Silver Medal, Exhb., Simla Fine Arts Society, Simla. 1930, 31, 33, 35, 41 He won 5 Silver medals from the State of Mysore, Mysore. A popular genre, portraiture was about sharpening ones sense of observation, understanding of light falling on the form, and the accuracy of drawing which were almost inevitable to be an accomplished painter. For Indian artists who had practiced art at either a transcendental or then mythological level, the physicality of the world around was never the goal. In case of Sardesai, there is an unpretentious realism that captures faultlessly the ordinariness. 1915 Appointed as a teacher for two months during the leave vacancy period of Late Shri Rao Bahadur Dhurandhar. 1917-20 Worked in special painting class of J.J. School of Art, Bombay. 1920-30 Worked as a drawing teacher in the Fort & Proprietary High School, Fort, Bombay.